It’s time to get freaky with Frank, the funky, fun-loving Frankenstein Monster that will have you howling at the moon in happiness once you’ve bagged yourself a spookily generous fortune when you join the monster mash gang in this hallowed slot game. Frank will be there to give you a helping hand – quite literally – as his monstrous, luminous green, decapitated spare hand will be lurking around the reels to help you grab some prizes. You’ll love the colourful, Halloween inspired slot game which will reap rewards which will outshine any trick of treat prize. The screen itself is filled with freaky bubbling potions and electrode bolts that set the scene for a scary slot game that is spookily lucrative. Are you enjoying this slot game? Visit our website and check out these slot games. 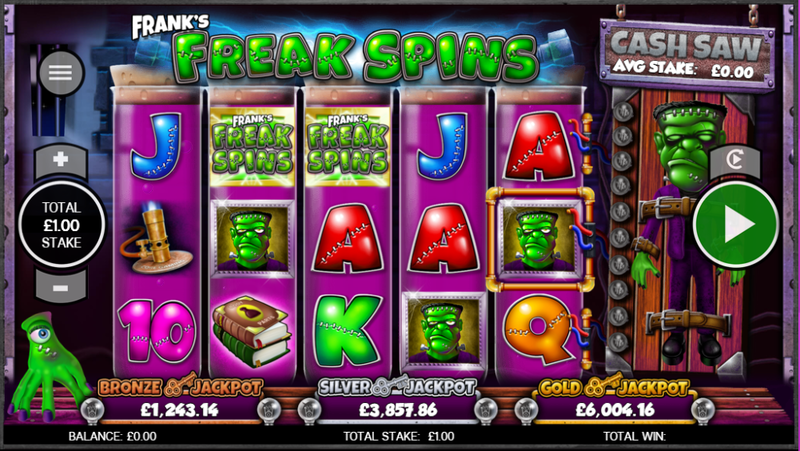 Frank’s Freak Spins is a fun, Halloween inspired slot game which is a 5 reel slot played across 20 paylines. Unlike other best-rated online slot games, this game included a spooky progressive jackpot ladder which leads to the opportunity to win three jackpots on the cash wheel which are globally funded, making the potential to win big scarily huge! 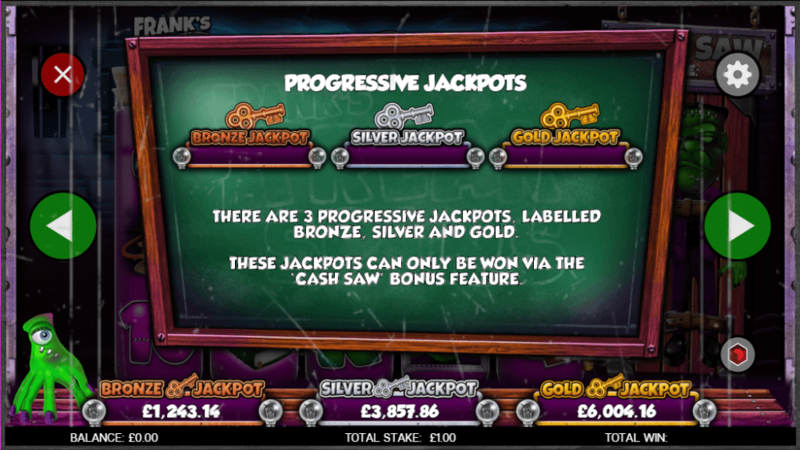 The jackpots are Bronze, Silver and Gold and how globally funded jackpots work is that each gamer who dares to play Frank’s Freak Spins pays a small percentage of each of their stakes placed in order to create the progressive jackpots. The bonus spin feature is the key to triggering this, which will be triggered when you spin three or more of the spooky scatter symbols. You also have the opportunity to win extra bonus prizes in a ‘Pick Me’ bonus game. Keep your eyes peeled for the Cash Saw, which is not something to be scared of, that’s for sure! You will be shown three saw wheels which you then spin the outer wheel which will then land on a prize. Watch out for the lucrative Electric Switch symbol, which is definitely a switch you want to trip and bring your cash drams to life as it electrocutes Frank and wakes it up and at the same time, adding a trail of cash in this fantastic casino slot games. If you’re looking for a spooky, freaky and wicked slot to sink your teeth into this is the slot for you, especially if you’re a Halloween or horror film lover. You’ll feel like you’ve been transported to Transylvania to Dr Frankenstein’s laboratory and partying with the ghouls especially when you see the array of spell books, bubbling potions and Bunsen burners set against the alluring purple and green reels. Give this comical horror slot a whirl and you won’t be disappointed with your spooky spoils. Best of all it’s optimised for phone and tablet as well as a desktop so you can get freaky with Frank on the go, whenever and wherever! Having any luck in your experiments in Frank's Freak Lab? Why don't you try Midas Gold?